At the top of the news we showed you how Education Minister Faber is under extreme scrutiny tonight for an alleged assault on his girlfriend. But he's still holding unto his portfolio as Minister of Education. Budget-wise, it's the biggest portfolio in all of government - and last week, before his public life was thrown into a tailspin, Faber and the Ministry of Education higher up's planned a media breakfast to discuss nine subjects which are all topical at the opening of the new school year. First among these was that subject which might also be a subject dear to you parents, the issue of those school fees, outside of tuition, which seem to increase every year. "Primary school fees my friends are set by the school but are approved by the Ministry of Education via the Chief Education Officer. And so there is no school that should be charging outrageous primary school fees or fees for that matter at any level that is receiving aid from the government or where it is a totally government or state own institution. We are asking parents to make the reports where primary school fees are gone over what it was in previous years to our ministry and schools must be aware that raising school fees without the proper approval of the Ministry of Education in fact is not proper according to the regulations of the education system and we want to ask that this be kept to where it should be, so that we don't have further problems with this." And much the same applies at the secondary level - where, again, fees have to be approved by the ministry:..
"Secondary schools cannot and should not be arbitrarily changing fees without proper approvals from the Ministry of Education. I believe the way the rules are worded proper permission must be granted from either the chief or myself the Minister of Education for school fees in high schools to be increase dependent on what kind of school it is; if its grant aided or it's a government school. So any high school that is raising fees at this time - that practice is found upon, in fact as you know since 2010 that fees should have been frozen and in fact no school should be charging additional fees. In fact we are in negotiations to see how schools can lower fees that they are charging at the secondary level. There are some institutions across this country who still go ahead and charge students when they know that there is aid coming from the government. I partner in this regard to desist from doing so, for instance putting that charge on a bill when they know that the government is going to pay. This applies for schools also who are receiving the subsidy grants. In Stann Creek and Toledo for instance where every child at this point is getting the subsidy. I've seen schools that are putting on - on the second formers the full fee, when in fact they know that those students once they are promoted will in fact receive the $300 subsidy and so I ask the schools not to so that. I am not starting a war, I am not starting a quarrel, but it cannot be fair and we cannot support you putting on there." 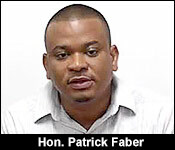 Faber also had strong words for schools which are taking increased government funds for needy students and investing it in new infrastructure:..
"There are some schools who are getting more money than they use to get and as a result of this now they are suing these monies to do all sorts of projects, building gymnasiums and all of this which we are not encouraging from the ministry whatsoever. We want to make it clear that additional monies that are given under the secondary school finance reform initiative ought be use for the development of the individual students. These monies are given for students as I've said who come from poor socioeconomic backgrounds and who are academically challenge and it is intended that the schools will use the monies to support these children to ensure that they don't have to repeat or that they don't drop out. Building buildings and beautifying your campus and buying extraordinary flurry equipment that will not necessarily aid in the children development and the students development is not going to improve those children and that kind of practice we will indicate from now is found upon by this ministry and we urge schools to be very careful when they are deciding how to spend those monies." And, keeping it controversial, Faber also spoke candidly about BRC books and the Roman Catholic School Management. BRC Printing is the Benque Viejo based publisher that has strong ties to the Catholic Management. And, now, Faber is saying that the Catholic Management wants parents to buy a revised book from BRC which they are not required to purchase:..
"It has been brought to our attention that they are saying to children that they must purchase the new versions of these books for BRC and we want to make it clear for the record that this government has a free text book policy that those textbooks are provided by the Ministry of Education and that it is against the wish of this ministry, certainly against the practice of this ministry for any school to be requiring children to be purchasing books outside of what is being provided by the ministry. They should not be mandated, if it is the school feels that it needs some additional textbooks - that has to be completely optional and we still don't encourage it, but if it is done, it has to be clear to the parents that it is completely optional." And moving from Church managed schools to government managed ITVET's, Faber announced that Cabinet has approved the return of the Centre for employment Training. Remember those? They were phased out in 2003 to make way for the ITVET's. But 11 years in, it's not working. Government is spending four million dollars annually on 600 trainees at six ITVET's across the country. Part of the problem is that the ITVET's are for more advanced learning while the C-E-T's were for primary school leavers. Faber talked about the decision now to re-open CET's at the campuses of ITVET's which will remain open. "The ITVETs have been struggling to take off in the manner in which they should have even after years of operation. That we've been wasting lots of resources and I say wastage merely because we are not getting the best bag for our buck, but with the reintroduction of the CET model, to run at the same time with the ITVET model we are hoping to be able to capture both of the segments of our young people's educational needs without sacrificing either, without having to mix early school leavers with those who are trying to achieve greater levels at the technical and vocational level, so that is our hope." "I will say this for the record that I have long been concern about what has been happening at Gwen Liz and as far as Mr. Blades is my aid and he has manage to get himself in the position of the Chair of Gwen Liz, it is my desire to use whatever relationship I have with him to correct and make sure that all that is going on at Gwen Liz is up front and accounted for. That's not an accusation against anybody. For the record I have most confidence in Mr. Blades and whatever relationship is there I will use to try to set things right and to make sure things go correctly at Gwen Liz. It is the only high school in my constituency, it serves my constituents and I want to make sure that they get the best bang for their buck." "And so in the future of Dr. McKay continuing to serve in her capacity..."
"I am not the person to answer that. I am telling you that there are measures now being put in place as far as I understand it to make sure that there is accountability in the school. Now if Ms. Mckay finds herself on the opposite side of those measures then it is not me or is it anybody else who is putting her out of the door." Faber spoke on at least five more topical subjects - but we'll have those tomorrow. Later on in this newscast, you can hear what the PUP has to say about his present troubles.